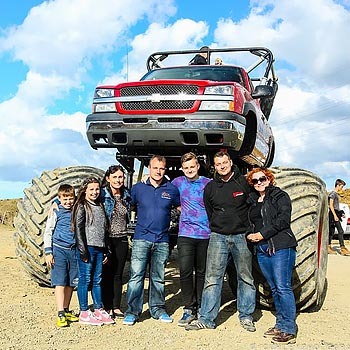 There’s only one US spec Monster Truck in the UK, and there’s only one location where you can drive monster trucks – East Grinstead (West Sussex). Midway between Crawley and Tunbridge Wells, it’s a bit of a trek unless you live around the South of England. But having said that, if you want the full monster truck experience, it’s well worth the journey. 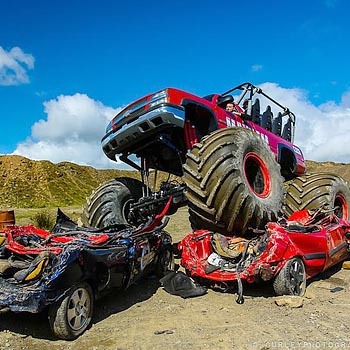 This is awesome – the only place you can buy the only car crushing experience in the only monster truck in the UK – An absolutely amazing experience! American or European monster truck? There’s not a lot of difference really, they’re all massive, but US monster trucks are a bit bigger. We prefer the US monster trucks, but it’s up to you, and you’ll still need a ladder to get into the seat or either! Think who the experience is for, are they a US monster truck connoisseur, or just someone who’d love to drive a car with massive, comedy wheels! 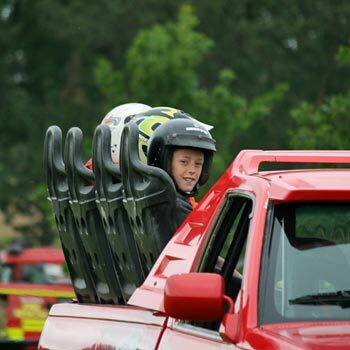 Our favourite monster truck experience is the American monster truck driving experience. Sorry for being obvious, but bigger really is better when you come to monster trucks. The experiences are mostly very similar, and the difference in price tends to be the addition of other vehicles. The amount of time you spend in the big car is the same, so we’d recommend you go for one of the cheaper ones, unless you want to add to the day with experiences in a few other vehicles in the same visit. What happens on a monster truck experience? Whatever truck you end up with, the day always starts with a safety talk, equipment instructions and a full safety briefing. These giants are dangerous if not handled with care, so they show you just how to do it. After that you will be taken to the vehicles and allowed to get to grips with the basic skills you’ll need to manoeuvre the truck on an area of flat ground. It’s a lot harder to drive a monster truck than driving your normal car – you’ll need some time to get used to it, so it’s important to experience how they work and understand the power. Then you’ve got the fun bit, roaring round the track and round obstacles, and then it’s over the obstacles. You’ll find that most monster truck days include several different trucks, so even if you buy the American monster truck day, you’ll see plenty of action in smaller vehicles. On some of these experiences, you even get to drive the beast on a car-crushing session, but details do vary a bit so check it out. Who is a monster truck experience suitable for? It’s a bit of a generalisation, but from the people we’ve talked to, this is a really blokey experience. We’ve had a few women book it too, and had great feedback. Of course, it’s probably not a good gift for your gran unless she’s up for some action – why not get her an Orient Express experience instead, and get this monster truck driving experience for yourself. The same truck experiences are marketed by all the major experience day providers, but prices can vary between them for the same ones, so check them out and make sure you’re buying the cheapest. Monster truck experience3.25Sarah FirminWhen you’re driving a monster truck, bigger is always better. So check out the best prices in the UK. Us too Kelly. Doesn’t it look crushtastic?! 15 minutes driving a monster truck was 15 minutes of roaring engines, bashing over hills and taming the beast. 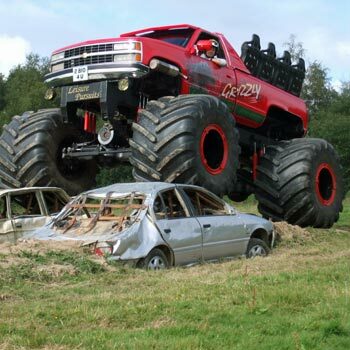 They teach you to parking and stuff, but lets face it, who wants to go on a ‘park a monster truck experience’? 🙂 I think that’s just so you know what your doing and you can control it, and so you can get onto to cool bit or roaring it around a field. And believe me, that bit is cool. 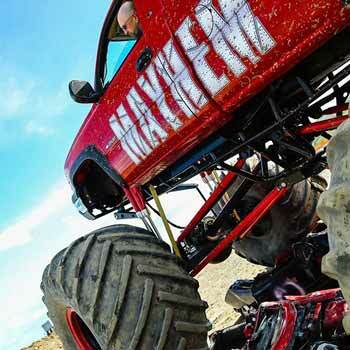 15 minutes of monster truck fun is more than most people get in a lifetime! We’d love to go on the car crushing experience but the price is too steep for us here at Best Experiences. If they dropped the price we’d be there like a shot.